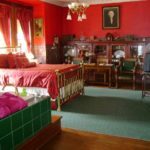 Each guest room has a queen size feather bed and its own private bath, some with marble mosaic tiles, clawfoot tubs, marble sinks and restored pull-chain toilets. Adding to your relaxation, four of the rooms feature over-sized whirlpools. 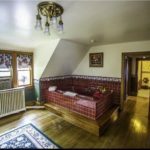 Every room is unique and boasts its own character and charm. 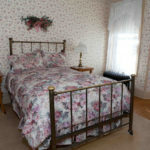 The Hancock Inn has decorated each room to suit that character and you are invited to select just the right room for you or that special loved one. 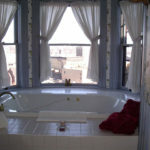 On the first floor this large, comfortable suite boasts a whirlpool tub, working fireplace, and a shower. 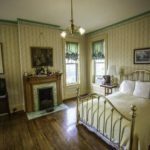 On the second floor this room has incredible views of Dubuque and the Mississippi River. 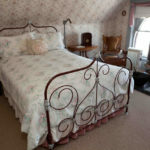 Beautifully decorated with a brass bed, a clawfoot bathtub with shower, and a working fireplace. 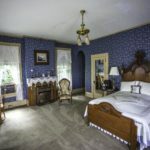 Also on the second floor with excellent views, this room has a lovely iron bed surrounded by the windows of the turret, clawfoot bathtub with shower, and a working fireplace. 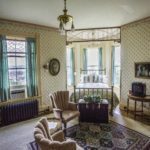 Located on the third floor with wonderful views of Dubuque and the Mississippi. 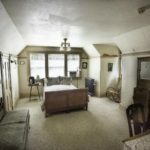 This cozy room is decorated with a pot-belly stove and amazing views through its 'eyebrow' windows, features a clawfoot bathtub and a bathroom skylight.